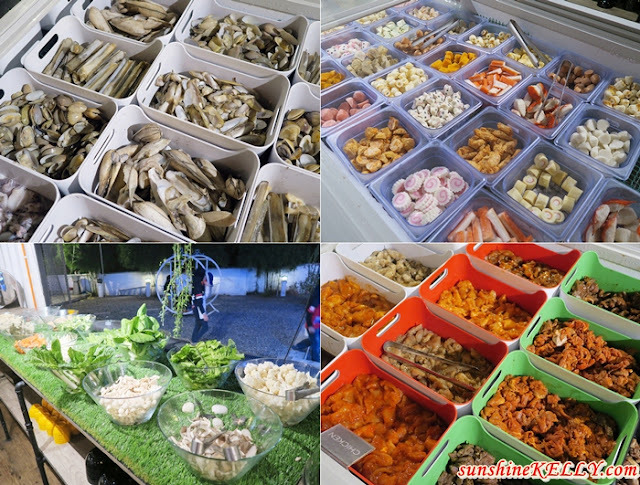 Weekend food hunt, we discovered a new steamboat place tucked in one of the residential area in Puchong, Selangor. ASAP Steamboat & Grill is a perfect place for dinner and gathering with friends and family. I was surprised with the overall picturesque décor, spaciousness, and landscape of this unique double storey container-concept restaurant. And it has an open deck on the upstairs for al-fresco dining. What are we waiting for? Jom makan! 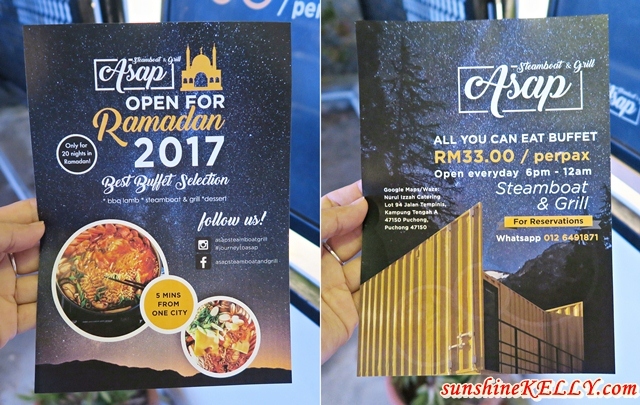 At ASAP is All You Can Eat Steamboat & Grill Buffet that served a varieties of marinated meats, fresh seafood, assorted fish balls and cakes, vegetables, noodles and others. There are also pre-cooked dishes like fried rice, noodles, fried finger food, and crispy soft shell crab, lamb soup, white rice, spaghetti Bolognese and others while you wait for your steamboat or grill. And these are buffet style also. I like their deep fried crispy soft shell crab dipped with thai chilli sauce, omg… I ate quite a lot of that. There are 2 types of soup base ~ chicken soup and tom yam. For those with children or not so into spicy soup maybe you can start with chicken soup first then towards the end you can try their tom yam. I personally love tom yam and all things spicy so my table decided on the tom yam soup. It’s moderate spicy so most of us can enjoy the soup as well. Overall the restaurants ambience is unique and their marinated meats are delicious. The selections of the seafood and fish balls are on par. We had a satisfying dining experience and their buffet price is very affordable of you wish to bring your whole family for makan-makan or special occasions or organize a friends gathering there. The price for adults only RM33 per pax and children from age 6 to 12 is half price. Location: Lot 94, Jalan Tempinis, Kampung Tengah A, 47150 Puchong, Selangor, Malaysia. Good food..great place! Been there a couple of times. The signature "Asap" sauce to go with the steamed or grilled stuff is super sedap! not a fan of steamboat but this looks nice. will love to try! Nice food but seafood and grill is not one that I prefer to go for because of the doubt of whether my food is cooked or not! I don't mind trying for at least one time, though. i loveee steamboat. especially when steamboat-ing with the whole family members. so fun.. Seems like a great place with great food and reasonable price. I will suggest this place to my friends, especially about the special Ramadan selections. Steamboat is my favorite! All you can eat style suitable for me!